unresponsive spots may be effectively treated by SmartLipo. Liposculpturing is especially effective in mommy makeovers to rid the common fat-ridden areas such as the tummy or belly area and the waist (yes, those nasty lovehandles). Although this is that one area that most patients complain about, SmartLipo may also be used for the upper arms (jelly arms), flanks, thighs, hips, and buttocks. Minor areas of complaint where SmartLipo may be equally effective are the facial areas such as the chin, as well as the back of the neck. Our specialists begin with the usual numbing procedure through local anesthesia. A handheld device is then placed directly upon the involved area. The laser power allows for the breaking and eventual liquefaction of the fat deposits. The dissolved fat drains out through the body’s natural excretion processes. Minor discomfort in the succeeding 24 hours is expected, but this may be addressed through palliative treatment. Minor bruising might also be present, which may be treated through icing. If swelling persists, a compression garment may be prescribed by our treating physician. Results may be immediately visible once the swelling has gone down. Further tightening and toning will be noticed in the ensuing four to six weeks post operation as this is the period wherein the skin adjusts to its new outlines. The results may be permanent as long as the patient sticks to a normal and healthy diet with regular exercise regimen. The overall length of stay required in Bangkok will depending on the type and areas of liposuction you request. Generally we recommend a 5-7 night stay in Bangkok to allow for proper followups and after care. The price for SMART Lipo in Thailand depends on the total number of areas treated with significant discounts provided for multiple areas. To get an accurate fixed price for having SMART Laser Lipo in Bangkok please contact us today. 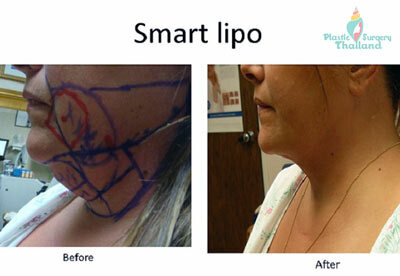 Although it wasn’t one of the Top plastic surgeries in 2014, Smartlipo continues to be one of the most popular techniques used in small area liposuction. If you are ready to start this year out right by destroying those stubborn bulges away, call one of our friendly staff online or via phone now for a virtual consultation, and you’ll be on your way to your dream body in no time.